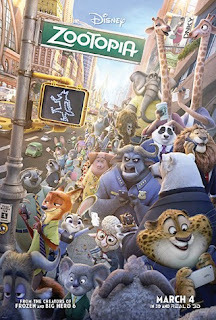 From the creator of Frozen (2013) comes a film set in a city of anthropomorphic wildlife. From the largest elephant to the smallest shrew Zootopia is a mammal metropolis where all creatures comfortably and confidently live and thrive together. Upon a complicated conspiracy, rookie bunny cop Judy Hopps is determined to prove to her and the skeptical that she can unravel and solve the mysterious case. Confidence is at a premium, however. This is because there are two major obstacles. First, she is the first rabbit to join the police force and secondly she must work together with none other than her natural nemesis, a fox. Not just any fox, Nick Wilde is a cynical con artist who looks to make her task more difficult. Ginnifer Goodwin, no doubt best known for her role as Mary Margaret Blanchard in the popular TV series Once upon A Time, provides the voice of Hopps. Blanchard is convincing with precise timing and delivery. And so is Justin Bateman who brings a long list of lending his voice or narrating to the character role of Wilde. And is he ever a character. Their relationship, while strained, is also complimented by differences. This may not make sense in words but it will when you’re watching these two develop. This marriage of characters is indicative of the talented writing and directing of Byron Howard (Tangled 2010), who in this film successfully maintains his trademark of creating protagonists that are either considered enemies or are usually an optimist and their cynical friend, ending with the cynic becoming more optimistic. Co-director Rich Moore (Wreck-it Ralph 2012), on the other hand has had his own success with The Simpsons. Need I say more? Animated films come and go and often seem to be redundant in their content as well as the special effects. However Zootopia will make you forget all that with its excellent execution of twist and turns in the plot and seamless animation. These characters not only reach and touch the viewer emotionally they also convey valuable lessons life. Like most other animated movies Zootopia is not just for children. Only adults could relate to some of the innuendo’s and relate to a few parodies found within the film visually and verbally. To miss this movie is to deprive yourself and family a chance to be highly entertained and enlightened.